390 pages, 8.5" x 11"
This new SABR book about the history of the Winter Meetings contains stories and hidden treasures that may help resolve moments of wonder that have periodically crossed your mind as a baseball fan or as a scholar. So much of baseball history happened at the Winter Meetings. This book provides you with a historical answer to the business of baseball over many of the early years of the minor leagues, the National League, and the American League, and even features a chapter on the Eastern Colored League Winter Meetings. Important philosophies regarding chosen identity, reactions to societal trends, agreements on how to operate, approval of new members, and player transactions emerged from the discussions and decisions made at the winter meetings. This book represents the first of two volumes to cover the history of Baseball’s Winter Meetings. Volume One covers the years 1901 through 1957, and Volume Two (to be published in 2017) covers the years 1958 through 2016. The first volume covers the years of twentieth century baseball from the first year there were two “major leagues” — the American League having begun as a major league in 1901 — and running through the final year before expansion to the West Coast. The second volume brings coverage of the Winter Meetings through the 2016 gathering in Washington, D.C.
Volume One comprises the collective work of a team of 38 SABR researchers and editors. The overall project was initiated by SABR’s Business of Baseball Committee, the brainchild of editor Steve Weingarden. Volume Two will comprise the work of a number of the same authors and editors, but more than two dozen others. All in all, well over 60 SABR members will have contributed to this effort, including Abigail Miskowiec, Aimee Gonzalez, Andy Bokser, Bill Felber, Bill Nowlin, Bob LeMoine, Chris Jones, Christopher Matthews, Dale Voiss, Dennis Pajot, Ely Sussman, Eric Frost, Frederick C. Bush, Gary Levy, Gregory H. Wolf, Jacob Pomrenke, Jason C. Long, Jeremy Green, Jerry Nechal, Jim Howlenhaus, Jim Overmyer, Joe Marren, Marshall Adesman, Mike Lynch, Nick Klopsis, Nick Waddell, Paul Hensler, R.J. Lesch, Rich Bogovich, Roland Hemond, Silvio Sansano, Stephen R. Keeney, Steve Weingarden, Steven Bryant, Ted Leavengood, Travis Stern, and Zak Schmoll. E-book: Click here to download the e-book version of Baseball's Business: The Winter Meetings: 1901-1957 for FREE from the SABR Store. Available in PDF, Kindle/MOBI and EPUB formats. 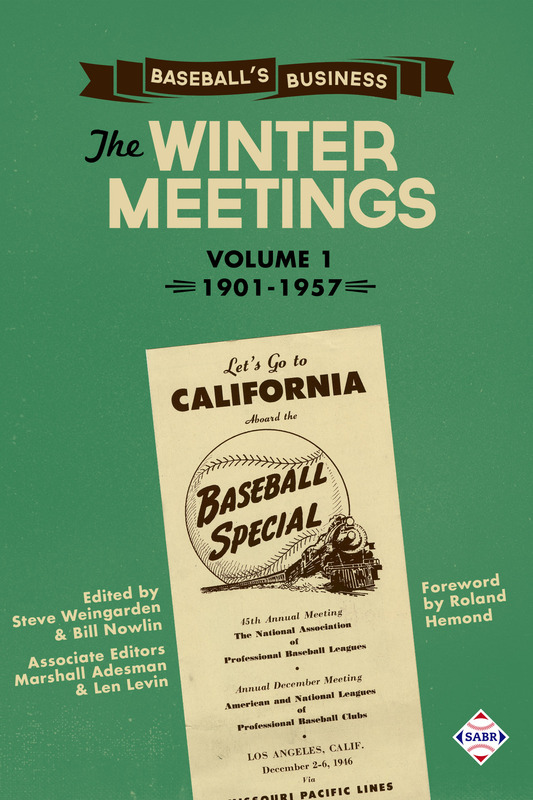 Paperback: Get a 50% discount on Baseball's Business: The Winter Meetings: 1901-1957 paperback edition from the SABR Store ($15.99 includes shipping/tax). E-book: Click here to purchase the e-book version of Baseball's Business: The Winter Meetings: 1901-1957 for $9.99 from the SABR Store. Available in PDF, Kindle/MOBI and EPUB formats. Paperback: Get the paperback edition of Baseball's Business: The Winter Meetings: 1901-1957 from the SABR Store ($30.99 includes shipping/tax). For 40 years, SABR and its members have led the way in publishing the best baseball historical and statistical research. Our publications program is shifting to take advantage of new methods of publishing. Not only will we continue to publish new books like CAN HE PLAY? A Look At Baseball Scouts and Their Profession (released in December 2011); OPENING FENWAY PARK IN STYLE: The 1912 World Champion Red Sox (May 2012); Detroit Tigers 1984: What A Start! What A Finish! (December 2012); Sweet '60: The 1960 Pittsburgh Pirates (April 2013); Inventing Baseball: The 100 Greatest Games of the 19th Century (July 2013), and Thar's Joy in Braveland: The 1957 Milwaukee Braves (May 2014), which showcase the best efforts of SABR's members, chapters and committees, but new technology makes it possible for us to bring out-of-print titles like RUN, RABBIT, RUN: The Hilarious and Mostly True Tales of Rabbit Maranville (February 2012), GREAT HITTING PITCHERS (March 2012), NINETEENTH CENTURY STARS (August 2012); Batting (January 2013), The Fenway Project (September 2013), and The National Pastime: Premiere Issue (December 2014) back again. This page was last updated December 8, 2017 at 2:25 pm MST.